I have some money left over from my tax rebate/work bonus check, and I am going to buy some new tech toys with it. I thought I knew originally exactly what I would get, but situations have presented themselves and I now am faced with multiple options. I’d appreciate some suggestions on which road to travel. Option #1: Buy the new Adobe Creative Suite 3 when it comes out. I am quite frustrated with CS2 as it is not Universal Binary and takes about 15 years to do even the simplest task. Option #2: Buy an HD Camera. 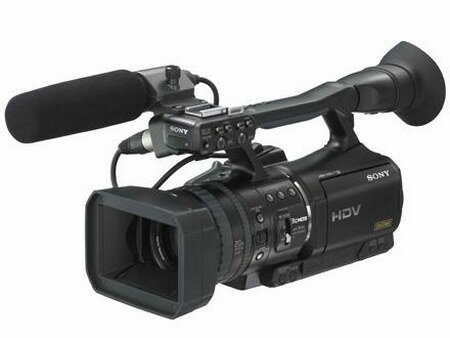 You can get these fairly cheap nowadays, and since my regular video camera recently expired, I could really use one. Option #3: Buy a SLR digital camera AND a Wacom Pen Tablet. These would both greatly enhance and help boost my skill with design and further my business. I can afford any of these options, but only one. Which do you think I should go for? I don’t like Option #1… for obvious reasons. Option #2, I don’t think you would use the camera anytime soon to require an HD video camera so it would be a nice purchase, but really an irresponsible way to spend money when a normal camera is good for current needs. Option 3, seems like the best choice. You get two presents and both would benefit you in the now. I have said my peace. Or, you could take secret Option D, give Jimmy the money! Go for the SLR Digital Camera and Wacom Pen Tablet. It seems like that is the best deal and…I lurve digital cameras, they’re fun and do things. i have to agree with the others. Option 3 is the best. I love my SLR, but it isn’t digital. Yeah, after you pay back an individual who shall remain nameless, pion 3 looks pretty good. @AJ… oops. In the wake of the Retreat I must have forgotten. @All… The thing I am worried about with #3 is that I will not be able to fully take advantage of what they can do without first having #1. So yeah, I’ll have this neat stuff, but I won’t be able to do anything with it. And then #2 still looms because my trust Sony DCR-TRV250 has died and there is much I want to film, but cannot. How about I just take a collection and do all 3?